In addition to the elite dressage and showjumping competitions, the London International Horse Show at Olympia also adds a element of fun with events like the Shetland Pony Grand National. Competitors, who are aged between 9-14 and must not be taller than five foot (152.4 cm), race around the arena on a miniature course with jumps which mimic those seen at an Aintree Grand National. BBC Sport's Nick Hope goes behind-the-scenes to meet some of the aspiring star jockeys and their ponies, who have been raising money for Great Ormond Street Hospital. 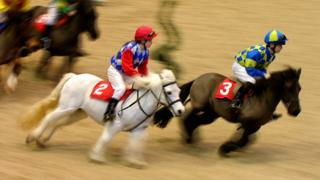 Find out how to get involved with equestrian sport here.